Meet the latest edition to the cast of Gamer Girl & Vixen: Tyrannosaurus Regina! I’m rather proud of this character. I’m surprised nobody has ever used that name before in comics! Well this is me, claiming that name for all posterity! Tyrannosaurus Regina is the next hit villain sensation, and she’ll be debuting in volume 2 of Gamer Girl & Vixen! My writing partner, Kristi McDowell, and I are already hard at work writing the script for volume 2. And we’ve got artist Gemma Moody and letterer Taylor Esposito back on board. Gemma designed T-Regina up there and she looks gorgeous and killer! Gemma has such a great eye for design. I’ll have more information about volume 2 soon. 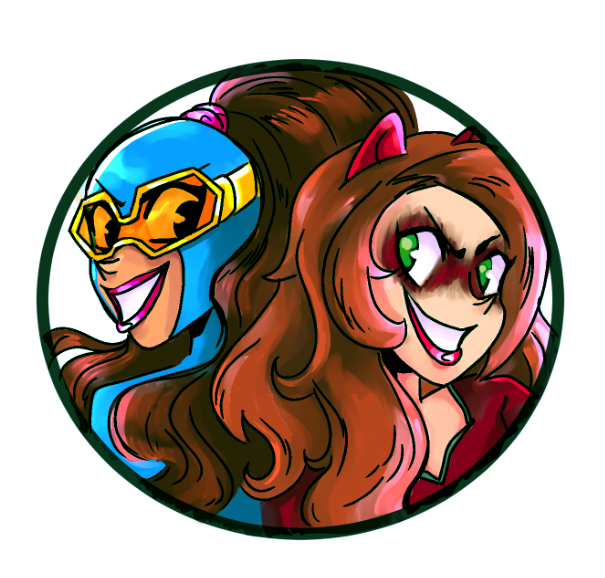 Basically, Gamer Girl and Vixen are going to find out there’s a lot more to being a super-villain than just going on fun capers and robbing celebrities. There are some seriously dangerous bad guys out there, and they mean business! Volume 1 is still available to purchase. Have you read it yet? Let me know your thoughts in the comments! Posted on August 28, 2017, in Comics, Gamer Girl & Vixen, My Comics and tagged Gamer Girl, Gamer Girl & Vixen, Tyrannosaurus Regina, Vixen. Bookmark the permalink. Leave a comment.